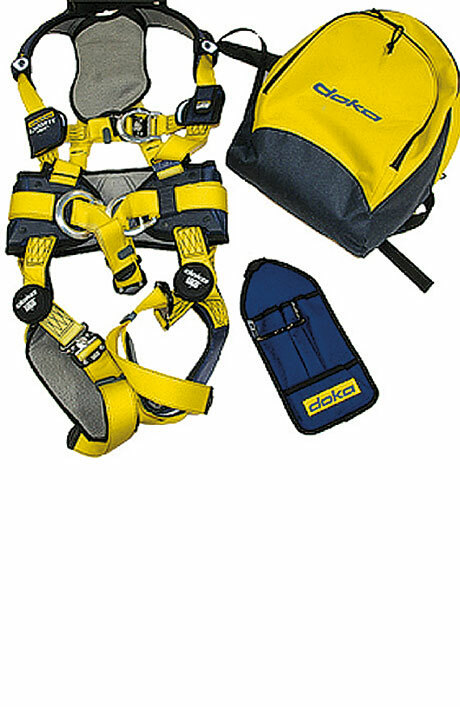 This system is the universal safety solution for all edge pro­tection needs. 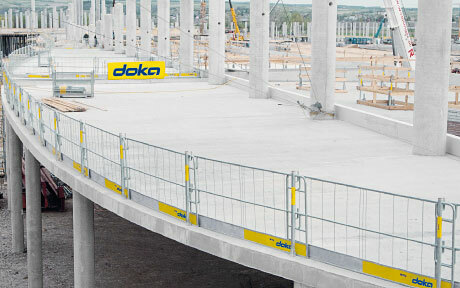 It fits in ideally with Doka systems – be they wall or floor-slab formwork – for safeguarding slab-edges or as fall-arrest barriers on the structure shell. The Handrail post XP 1.20m features 'use-anywhere' versatility, covering all types of edge protection. 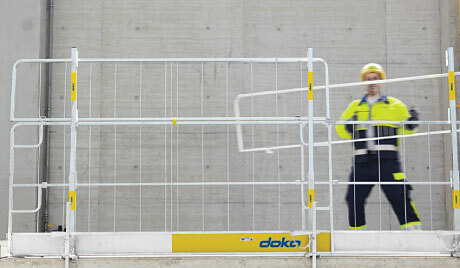 Either protective gratings, wooden planks, scaffold tubes or gap-free boarding can be used as the safety barriers. 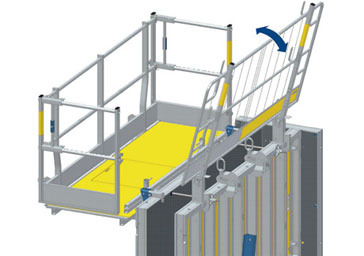 The Easy-Click function makes it quick and easy to mount and dismount the Handrail post XP 1.20m without tools, and locks automatically to prevent accidental lift-out. 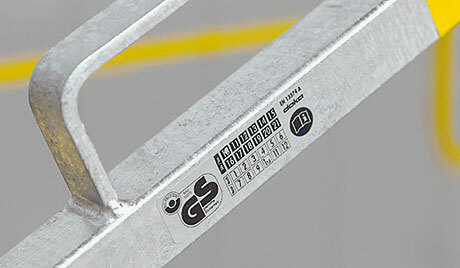 The edge protection system is EN 13374 compliant, as certified by a GS Mark awarded by an external institute. Detailed User Information booklets and dimensioning diagrams, including wind-loads, are available. The integral hollow frame gives the hot-dip galvanised Protective grating XP great stability and a long lifespan. 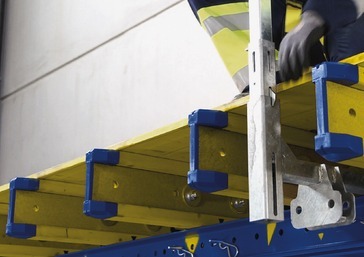 The integral toeboard and the handles make for safety and flexibility, particularly when work is being carried out at slab-edges and on facades. The system can be extended to a grating height of 1.80 m simply by adding specially developed bottom-fixed height extenders for the uprights. The distances between the uprights do not need to be narrowed for this. 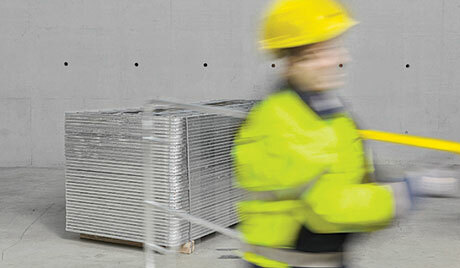 The design of the system makes for very simple and space-saving warehouse and site logistics. 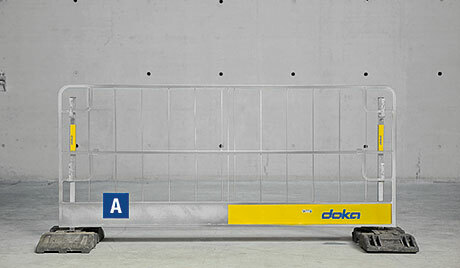 The system is compact to transport and easy to handle. 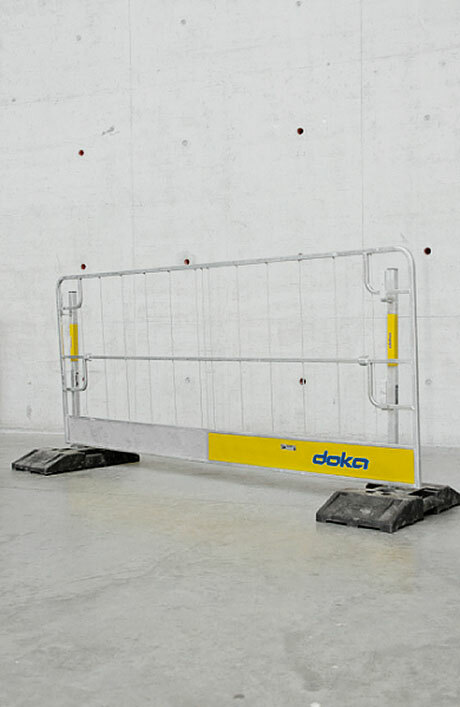 The Protective grating XP is available with the customer's logo and corporate colour on request, turning it into a high-visibility advertising vehicle on the site. (A) Your logo could appear here. 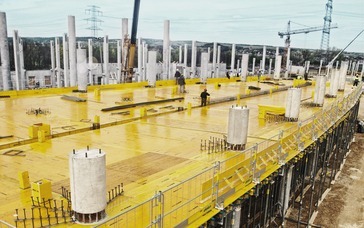 The system is rounded off by practical connectors to meet the requirements of any situation – concrete floor-slabs, stairways, bridge superstructures, wall and floor-slab formwork or platforms. The connector component used for safeguarding exposed slab edges or the narrowsides of platforms is the Railing clamp XP 40cm. 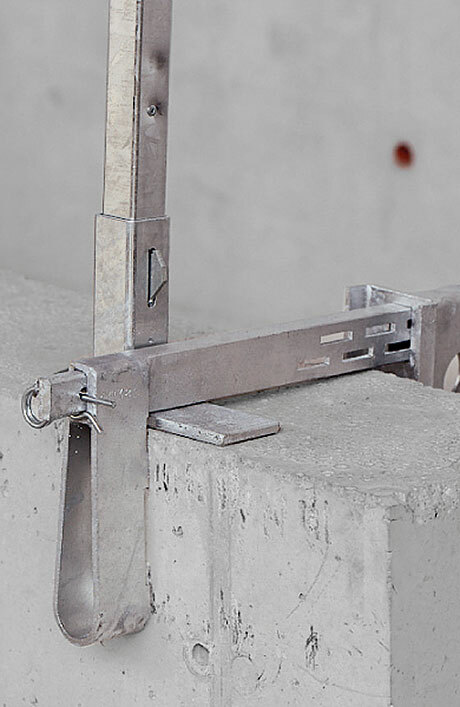 The constructional design of the clamp ensures that the toeboard is held flush with the slab or the formwork, so that no small items can fall off. 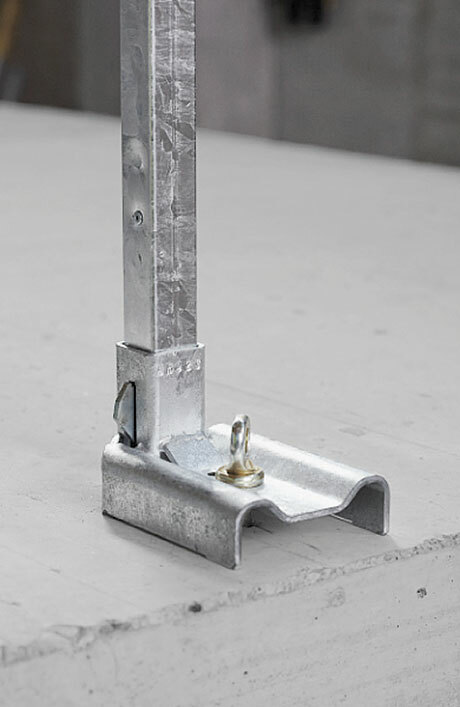 For bridge superstructures, a version is available with a clamping range of 2 cm to 85 cm. Fall-arrest barriers for e.g. guttering and other rooftop work can also be put up on flat roofs and parapets using Floor end-shutter clamps and Handrail-posts XP 1.20m. 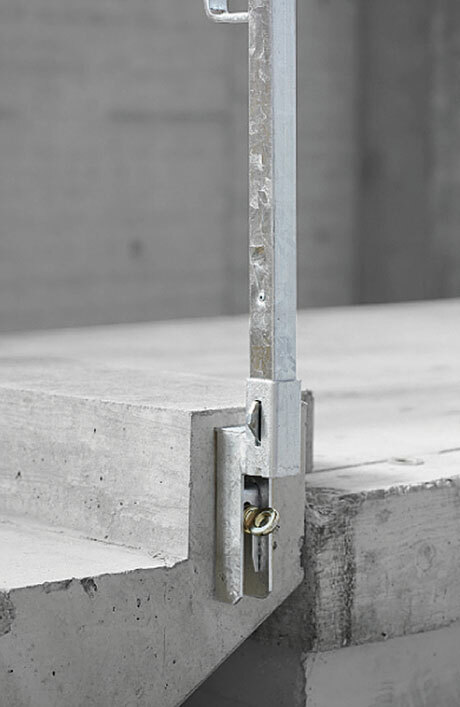 The Framax adapter XP is used to mount the side railings to the opposing formwork. 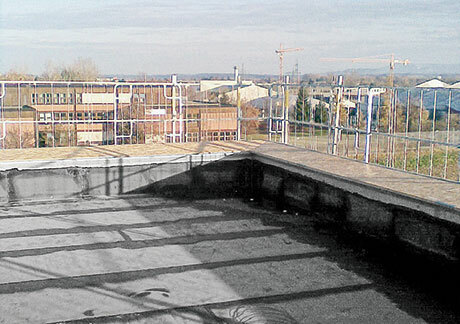 The advantage of this solution is that the side railings can be attached to the formwork while it is still flat on the ground, and will stay permanently fixed to the formwork both while it is being repositioned and when it is in the cleaning position (with the form-ply facing upwards). During pouring, the railings can be tilted backwards by 15 degrees. 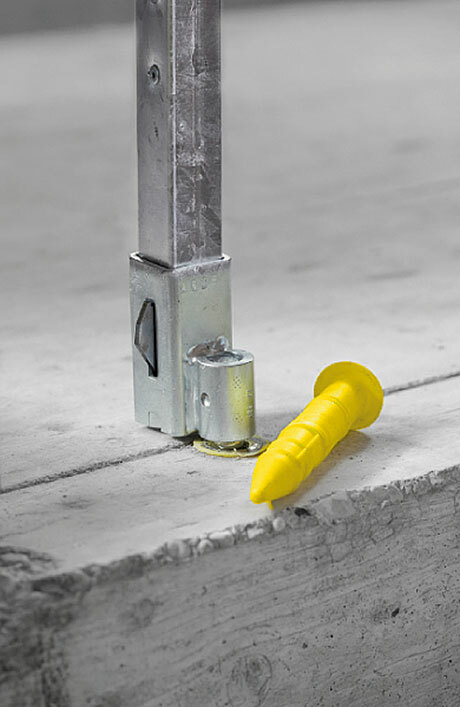 The Dokamatic adapter XP is used to attach a Handrail post XP to a Dokamatic table. The adapter is suitable for all sizes of table and has an integral lowering function. 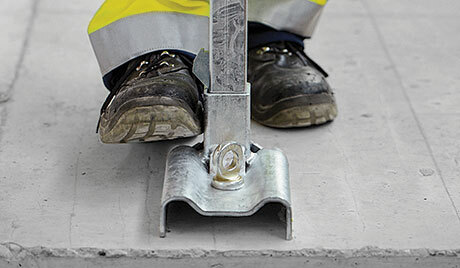 The Screw-on shoe XP and Screw sleeve 20.0 are pressed into the still-fresh concrete, meaning that the floor-slab is readied for the Edge protection system XP as part of the concreting operation. The Step bracket XP is fixed to the end face of the stairway and allows the tiles or flagstones which are being laid on the steps to project out by as much as 4 cm. Used in conjunction with the Express anchor 16x125mm, the Handrail-post shoe XP makes it possible to retrofit the side railings. 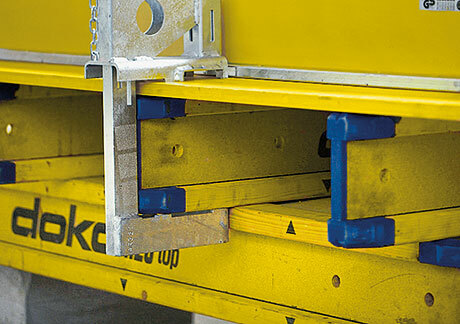 When combined with standard fence-feet baseblocks, the Edge protection system XP can also be used to demarcate different working areas within a jobsite. The Parapet adapter XP is connected to the Railing clamp XP 40cm or the Railing clamp XP 85cm; together with the Handrail post XP 0.60m, it then provides optimum edge protection on parapets. 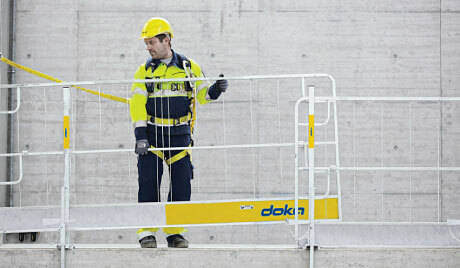 With the Doka personal fall-arrest set you can protect your crew in situations where fall-arrest protection such as guard rails or arresting devices are not possible. Requires introductory training.